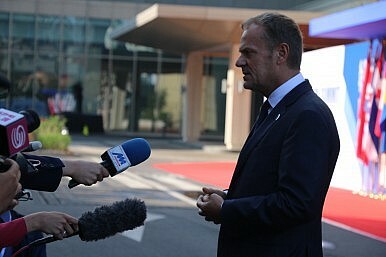 EU Council President Donald Tusk speaks with reporters about the attacks in Nice on his way into the ASEM opening ceremony. The 11th Asia-Europe Meeting Summit kicked off on Friday morning as Mongolian President Tsakhiagiin Elbegdorj welcomed leaders from 51 ASEM member countries to Ulaanbaatar, the nation’s capital. The presidents of Bulgaria, Croatia, Cyprus, the Czech Republic, Latvia, Myanmar, South Korea, and Switzerland are among the 10 heads of state in attendance for the two-day event. Other high-profile participants included German Chancellor Angela Merkel, Japanese Prime Minister Shinzo Abe, and Chinese Premier Li Keqiang. Delegates from the two continents held a moment of silence at the ASEM Summit’s opening ceremony for victims of the horrific truck attack in Nice that left over 80 dead during an annual Bastille Day celebration. Leaders from across the globe offered their condolences and condemned the terror attack during the Summit, including Chancellor Merkel, who called her fellow delegates “united” in their shock at news of the violence. The tragedy in France was an important topic, but was not the only significant security issue discussed in Mongolia on Friday. ASEM was the first major international conference following Tuesday’s ruling by the Permanent Court of Arbitration in The Hague that China’s claims on the disputed waters and territories in the South China Sea are without merit. “It is necessary to have a peaceful resolution for affairs involving the South China Sea,” Japanese Prime Minister Abe said in remarks in Ulaanbaatar. “We should attach great importance to the rule of law and hold onto the principle of not tolerating any attempt to unilaterally change the status quo by force,” said Abe. Before the Summit, Chinese Assistant Foreign Minister Kong Xuanyou warned that discussion of the issue at ASEM would not be welcome. China boycotted the arbitration process and claims the tribunal’s ruling is unjustified. A spokesperson from China’s Ministry of Foreign Affairs called the court’s finding “void of legality and representativeness” on Thursday. At ASEM, Philippine Foreign Affairs Secretary Perfecto Yasay called on all parties to exercise restraint regarding the matter but affirmed his country’s respect for the tribunal and its ruling. He urged for a peaceful resolution to the matter. Following a morning of bilateral talks—there are 80 slated in total over the two days—the delegates adjourned to the nearby Mongolian countryside to enjoy a traditional Naadam sports festival. The lavish outdoor venue nestled in a sprawling valley was dotted with guest gers, or yurts, a small stadium, and many outdoor booths filled with a wide variety of complimentary food and beverages, as well as souvenirs for sale. In an hours-long performance for its high-level guests, Mongolia put its finest cultural gems on display. In between the majestic sounds of a traditional orchestra, fully replete with horse-head fiddle, there were wrestling, contortionism, and horse-racing exhibitions, among others. Mongolia hopes the 11th ASEM Summit will be the first of many major international meetings over the coming years, and that it can capitalize on its strategic location between East Asia and Western Europe by establishing a strong reputation as a premiere global venue. “Mongolia, located at the conjunction point between Asia and Europe, is ready to facilitate the exchange and connectivity between the two continents,” said Elbegdorj. Mongolia Celebrates Naadam, Prepares to Host ASEM SummitInterview: Mongolian Foreign Minister Lundeg PurevsurenHow Russian Blue Jeans Created a Diplomatic Incident in MongoliaKazakh Activists Jailed For Making a Simple Statement: 'I Have a Choice'How Can Kazakhstan Revitalize Its Civil Society?